If I hadn't sat down to have a cup of coffee with Louise, I might never have learned about this. I almost didn't believe her, so she kindly offered to demonstrate. In the picture above, you will find the perfect lady's shaver – the gentlest, most effective and ideal way to pluck eyebrows, remove unwanted hairs and 'defluff' an entire face – safely, painlessly and precisely. Have you guessed what it is? All the hair-removing magic you could wish for can be done with a simple piece of thread. 'Threading' has been practiced for ages and ages (as a matter of fact – for so long that no one quite knows its origins). 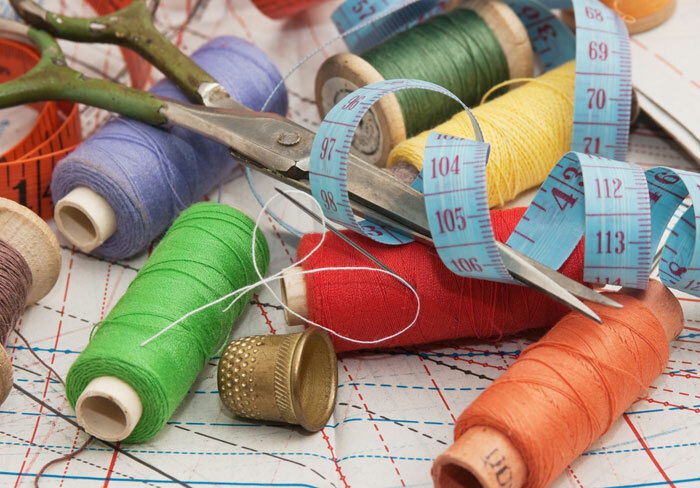 There are several methods of holding the thread, and each is equally effective. Shown above is the 2-handed-coupled-with-mouth-holding stance that many advanced threaders use. 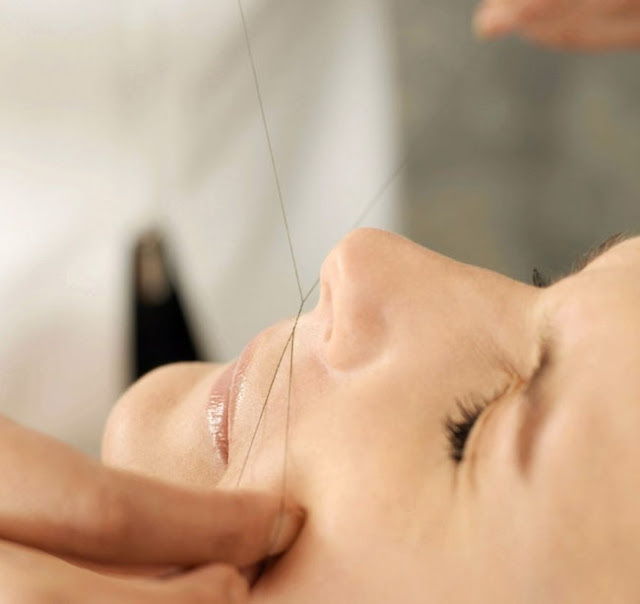 Experienced threaders can pluck single hairs with the precision of a surgeon, but one of the main advantages of threading is being able to remove an entire row of hairs – making for clean edges on areas like eyebrows and mustaches. Threading takes moments to learn, but lots of practice to become proficient at. Are you ready to give this a go? Don't worry, I'm not going to start you off with the advanced method; I haven't even learned it myself. Tie a single strand of thread into a loop. The loop should be about the length of a ruler. Hold the loop between your fingers. Twist 5 times – no more, no less. You now have a kind of 'figure 8' in thread. You're ready! This is your magic hair removing instrument! (I realize the pic is showing a rubber band that is not nearly long enough, but it's pretty impossible to demonstrate something with both hands, hold a camera, focus AND get the shot all at the same time, so you're just going to have to pretend it's a thread and that it's longer). Now, let's try the method. Open and close your fingers alternatively. As you do so, the twisted area in the middle will 'wander' from right to left. To make hair removing magic, lay the twisted area of the thread against your skin and 'walk' it back and forth across the area you want to de-fluff. That's it. Does Threading Take a Lot of Practice? I won't lie. In the beginning, it feels about as awkward as trying to cut the back of your hair using 2 mirrors and a left-handed scissors (or right-handed scissors if you are left-handed). I'm sure you get the picture. But it gets easier real quick – promise. I was trying to get the feel of it and was moving the thread around my face as Louise and I chatted. Although there was the occasional tiny nip, it didn't really feel like anything was happening. I mentioned that this was going to take some practice, but Louise replied, 'You must be doing something right – I can see little fluffs flying off in this light (I was backlit to her). A quick inspection in the mirror confirmed what she said. It was working. I've been threading for a few months now, and find it quite effective – not only for single unwanted hairs, but for those 'downy' hairs on the side of the face that sometimes catch the light and make you feel like a contender for a role in the Planet of The Apes. Thanks Louise, for enlightening me about threading! Did you know about threading? Have you ever tried it? Did you find it easy? Advanced threader pic courtesy of Wikipedia. yes! i just learned how to do threading on myself this summer, and i love it. it's almost painless, and great for hairs that are too fine to be properly grabbed by tweezers. threading has become pretty commonplace around los angeles-- you can have it done at the mall for ~$6! that seems cheap compared to other hair removal services here, but my friend from india thought it was too expensive; she says the going rate is ~3 rupee in india. I've had my brows threaded religiously for about 10 years now. You'd think I'd be used to the pain, but each time is like the first and I want to cry like a baby. But the results are so much more precise than with waxing. The young lady who I go to is an artist in her own right. I wish I could thread my own brows. I think I'll trust my brows to a profession threader for now, but I'm practicing on the rest of my face (where precision isn't as crucial). Like you said, it's awkward in the beginning but it works great! @Alicyn - OMG - six bucks for threading?! That's outrageously cheap. I'm officially on the next plane to LA!! @Stephanie - Let me know how it goes for you and if you pluck up the courage (yeah, lame pun intended) to do your brows yourself at one point. I live in an city with a large Asian community, so threading is readily available in salons. I have had it done, and it seemed to be a better method for me than wax, to which I have had an allergic reaction in the past. Don't think I would try it for myself though as it seems a bit complicated to do on yourself. So will stick with plucking my eyebrows for now ! Hi! I live in Copenhagen too. Did you find any professional threaders yet? I am just not brave enough to do anything to my eyebrows on my own!